Are you a fan of adventure tourism? Like to take yourself out of your comfort zone? Well, Silver Fern Holidays have got some adventure tourism ideas that aren’t for the faint at heart at all. Sure, ziplining is fun and so is jumping out of a plane. But is there any thrill that matches monster-hunting? That’s right, monsters. You may think they’re not real and you’d be forgiven for thinking they’ve been ‘debunked’, but they’re out there. And you could be the first person to find them. 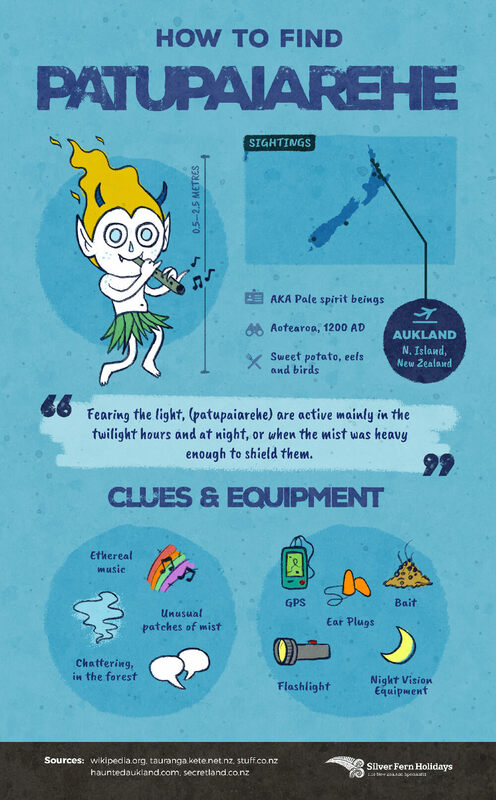 Silver Fern made these cards that give you the lowdown on how to find some of the world’s most infamous monsters. You’ve got their suspected whereabouts, clues you need to look out for and the equipment you need to fulfil your mission. 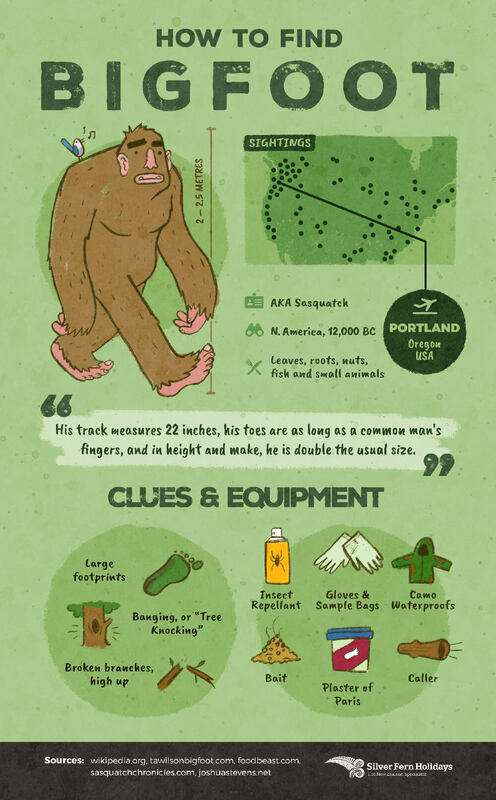 Bigfoot, aka Sasquatch, could be the most famous monster in the world. He’s certainly up there with The Loch Ness Monster, Godzilla and Piers Morgan. He’s been spotted all over North America, particularly in the dense forests of the Pacific Northwest. Bigfoot sightings have been going on for centuries and Dr Jane Goodall, who is famous for her work studying primates and anthropology, isn’t ruling out the existence of Bigfoot either. If the world’s most famous primatologist thinks Bigfoot may exist, then you probably should too. You’re going to want to keep your eyes peeled for Bigfoot’s large footprints, listen out for his ‘tree knocking’ and bring a Bigfoot caller. You’re also going to need a camera for this hunt. There have been over 3,300 sightings of Bigfoot so simply seeing him isn’t enough anymore. You need to bring the cold hard evidence home. Hidden away in the Scottish Highlands is a lake. A long, narrow lake that’s over 25 kilometres long. But this is no ordinary lake, because this is Loch Ness. Home to the Loch Ness Monster. First encountered in 565 AD by an Irish saint, the Loch Ness Monster has been described as a mix between a seal and Plesiosaur. A Plesiosaur is an aquatic dinosaur, for those that didn’t know. Fast forward roughly 1,400 years and Nessie is sighted again, and the mystery really begins. Has Nessie been in the lake the whole time? Could she have escaped out to sea, and comes back periodically to taunt the locals? Either way, it’s time we had some irrefutable proof that Nessie exists. 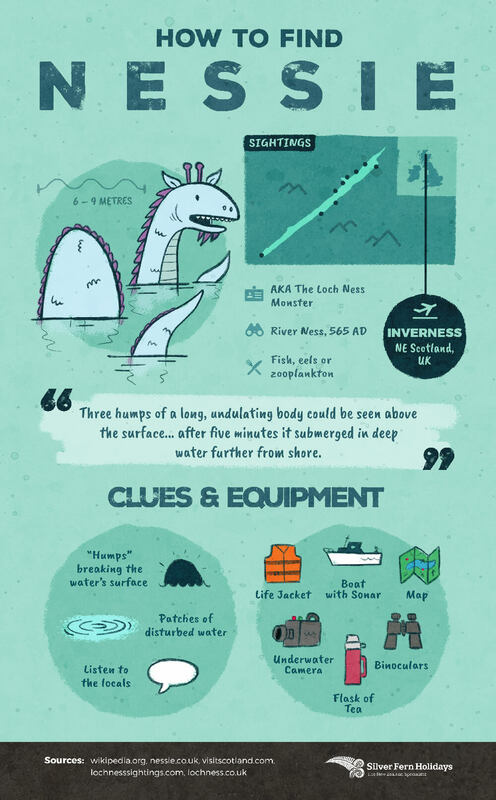 Despite what ‘scientists’ may tell you, it is perfectly plausible that Nessie survived the huge meteor that wiped out all the other dinosaurs and has found refuge in a Scottish lake. And when you find her, you can help tell her story and cash in on the movie rights. Next up is a trip to Central America to investigate one of the most peculiar of monsters. Most monsters have been around for a fair while, their story being passed on through folklore from hundreds of years ago. Not the Chupacabra. It was first sighted in Puerto Rico in 1995. The first sighting happened in March of that year. By the end of the year, ‘El Chupacabra’ had claimed the lives of over 1,000 animals. 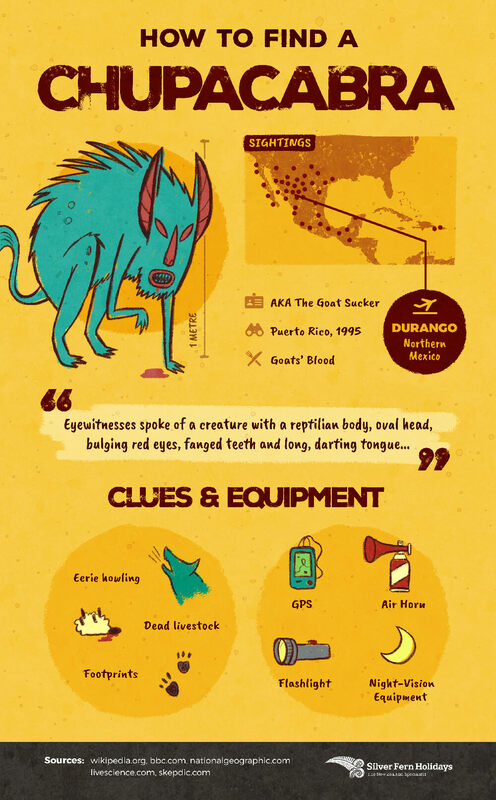 El Chupacabra has been sighted all over Latin America, however. So, could there be a whole species of them? People are still on alert for the creature or creatures and you could be the first to prove its existence. Its name literally translates to ‘Goat Sucker’. It specifically targets and drains all their blood through two or three puncture wounds. There are varied descriptions of what El Chupacabra looks like, and none of them sound good. So, be vigilant and brave. One of the lesser-known monsters of the world. 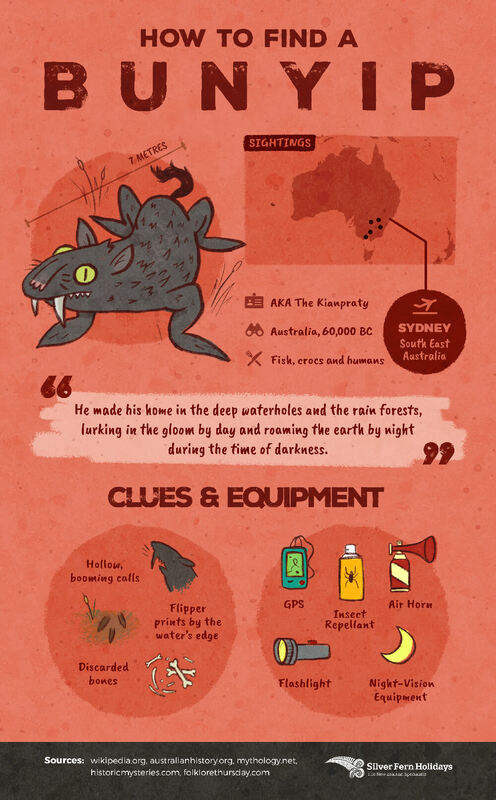 Bunyips have been in Southeast Australia for over 60,000 years. They’re 7 metres long and have been known to strike fear into the hearts of anyone that encounters them. They are water spirits that show no mercy and aren’t very friendly. For this monster, you’ll want to look out for flipper prints by the edge of any body of water, listen out for their distinctive calls and if you see a pile of discarded bones, they may have just had their dinner nearby. Keep yourself camouflaged and bring some night vision goggles. If you don’t find one, at least you can pop over to Sydney and see the sights. Some people will tell you that New Zealand is boring despite its rugged terrain, stunning scenery and it being Middle Earth in the Lord of the Rings film saga. Well, there’s nothing boring about looking for pale spirit beings that try to lure you from the forest trails with their ethereal flute music. Introducing the Patupaiarehe. They’ve been in Kiwi folklore for a long time now. These devilish beings are a mixed bunch. Some people who have encountered them talk of how the Patupaiarehe showed them truths about the world and enjoyed an all-around pleasant experience with them. Others talk of their hostility. Whilst Bigfoot is kicking it in the Hollywood hills, the Yeti is grinding out the eternal winter of the Himalayan mountains. 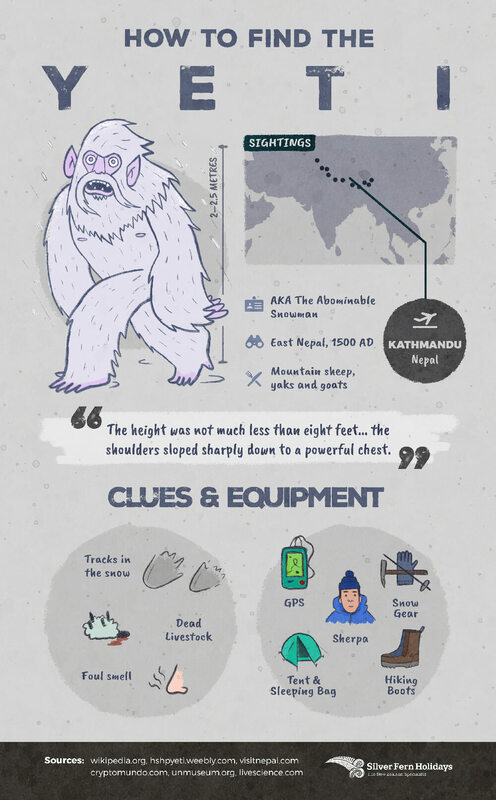 The Yeti may as well be related to Bigfoot, they’re very similar in stature and size. Maybe they are mortal enemies, or long-lost friends. Who knows? Our favourite documentary, Monsters Inc, tells us that the Yeti is a nice guy who got banished from the Monsters Inc scream factory and as punishment, he now must live out his years in the human world. He’s been known to feast on yaks and other mountain animals, so we’ll let you be the judge of whether he’s a friendly giant that’s been mistaken or a cold-blooded monster.